This 1-bedroom, 2-bathroom cabin rental in Honeysuckle Meadows will sleep up to 4 people and has wireless high-speed internet, TVs in the bedroom and the living room, a movie library, a pool table, and a hot tub. 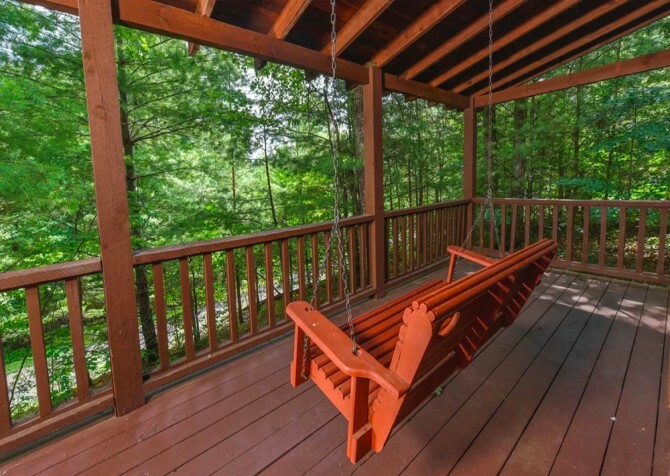 You will enjoy a full kitchen for family or group meals, and you will have plenty of outdoor space for taking in the beautiful mountain views all around you. You may choose to take advantage of the fantastic community amenities on property or take a drive to nearby downtown Gatlinburg, the Great Smoky Mountains National Park, or downtown Pigeon Forge for some fun and memory-making. 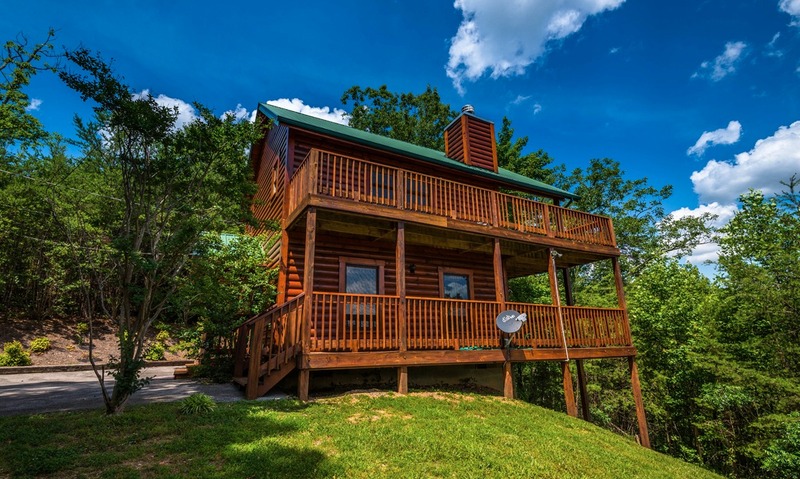 Whatever your reason for visiting, American Pride is sure to be a place you will be proud to call “home” during your stay in the Smokies. 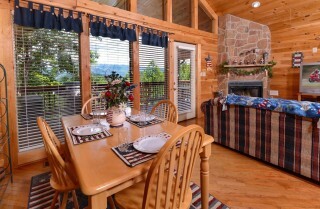 Floor-to-ceiling windows overlooking the majestic mountains and a lovely stone (gas) fireplace make this room the perfect place for relaxing. 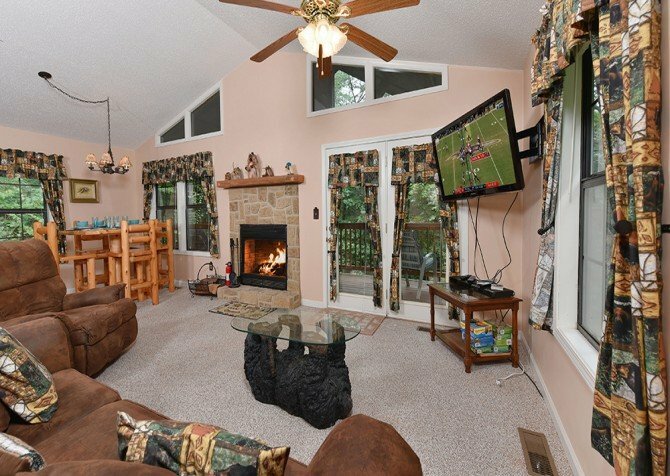 You will enjoy the large couch – which turns into a queen sleeper for extra guests – and the recliner as you kick back and watch TV or gather around the fireplace for morning coffee. The A-frame wood ceilings soar above and feature modern recessed lighting. 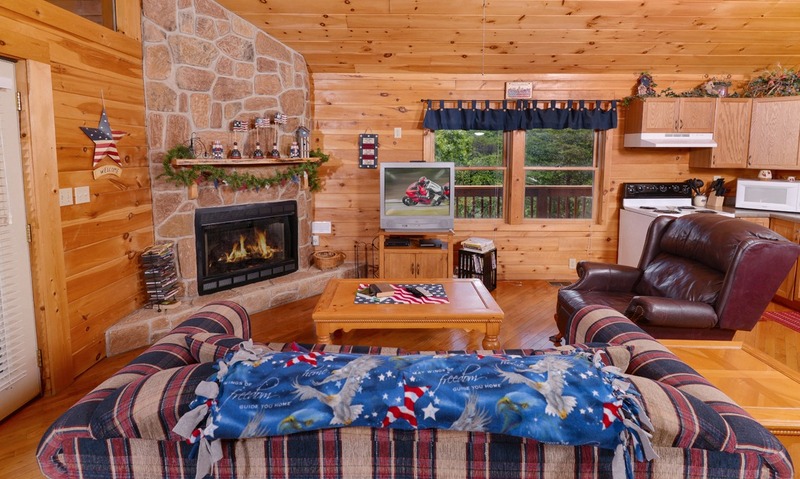 A coffee table and end table provide extra space for snacks, reading material, or games, and tasteful patriotic decor gives the room a homey touch. This room makes an excellent central gathering place for the family during your stay. Choose a movie from the library and have a movie night with popcorn, or bake some fresh cookies in the oven. 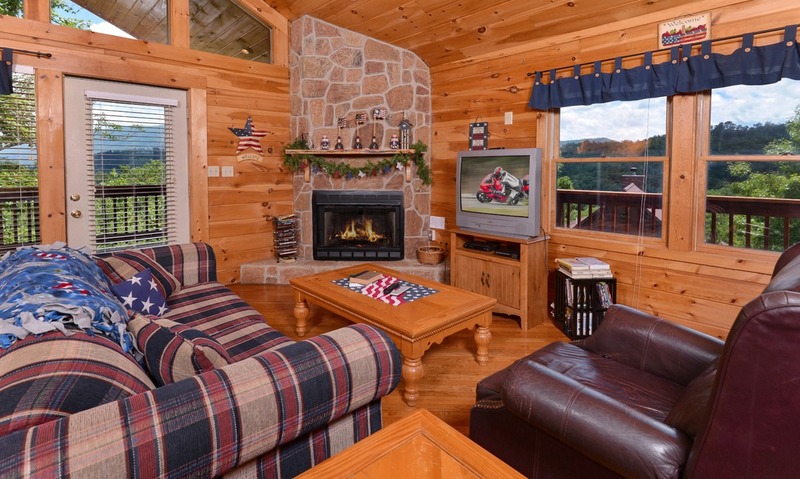 After busy days playing in the Smokies, this comfortable living room will be a great place to just unwind and enjoy the peace of the mountains and quality time with family and friends. 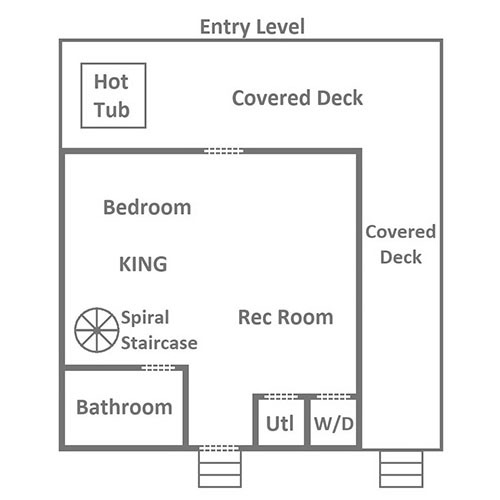 Just off the living room and open to the entire upstairs living space is the fully equipped kitchen complete with an oven, microwave, dishwasher, refrigerator, and all the extras you might need for making coffee or cooking up a meal to share with loved ones. 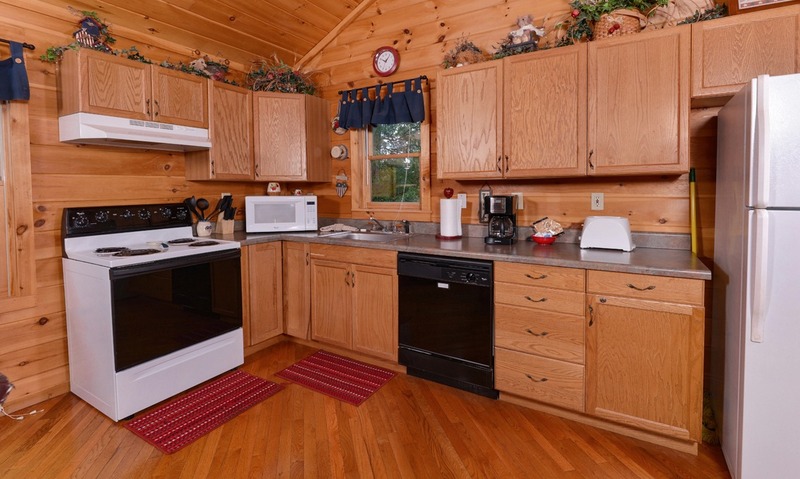 The kitchen also comes stocked with dishes, glasses and utensils for your convenience. 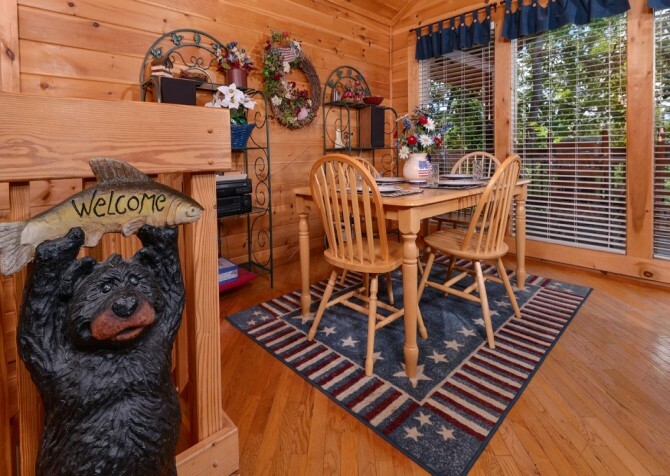 The patriotic theme carries seamlessly over into the kitchen, and with its warm wood colors, you’ll feel right at home whipping up a good dinner. If you would like to take a bit of the stress out of vacation planning, let our vacation planners know and they will stock your kitchen with one of several meal prep options from our list of cabin rental add-ons. You can have a romantic dinner for 2, a hearty breakfast, a picnic lunch, and more waiting for you upon your arrival here at American Pride. 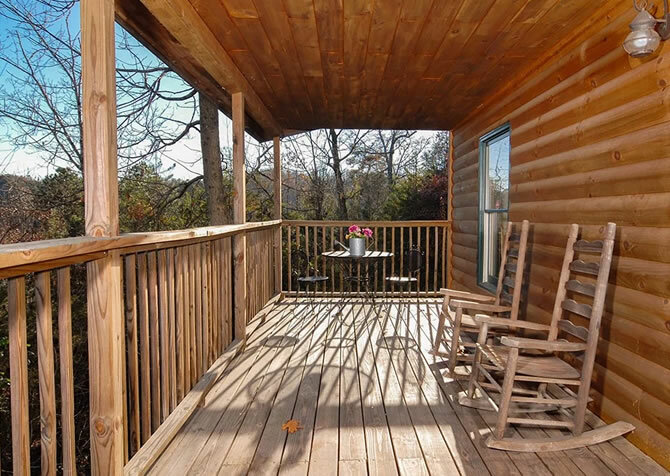 Cabins for YOU even offers a coffee-themed basket and a Spirit of the Smokies basket to add something special to your reservation! 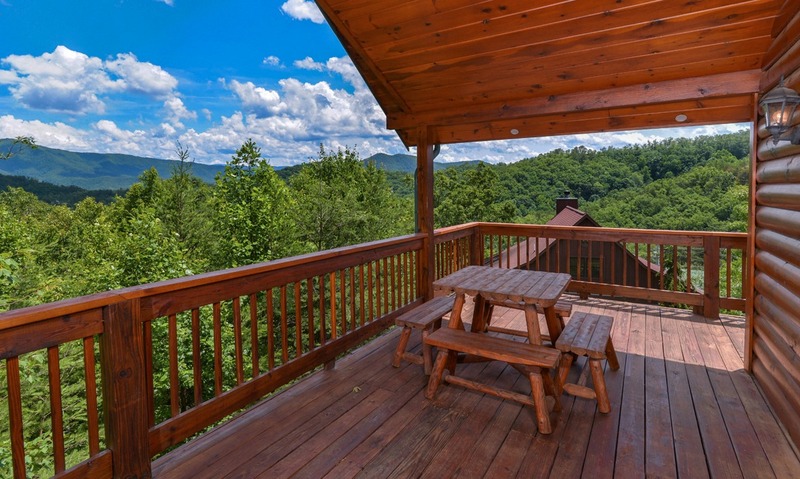 This attractive 4-person dining table sits in perfect view of the mountains so you can enjoy your breakfast, lunch, dinner, or snacks while gazing at the spectacular scenery. Of course, the red, white and blue colors also grace this area. American Pride is a perfect cabin for celebrating Independence Day or Memorial Day with the family, or just feeling right at home. You could even find a flag cake, cupcake, or red-white-and-blue fruit trifle recipe to bake up and have a scrumptious patriotic treat to showcase here on the table. 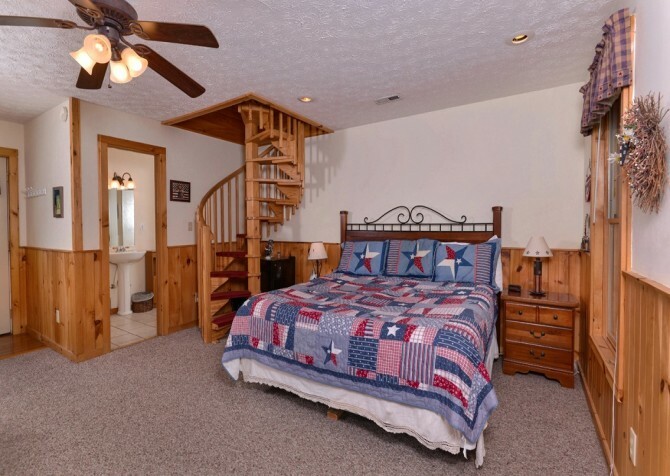 Located down the curved staircase is the bright and open bedroom. The king-sized bed is decorated with a lovely patriotic-themed quilt and shams, and nightstands with lamps bookend the bed. Across the room you’ll find a full-size pool table, a dresser and TV, and a rocking chair with ottoman. 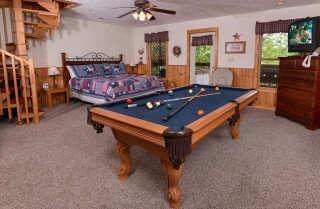 There is even a CD player for turning up some tunes while you enjoy a game of pool. 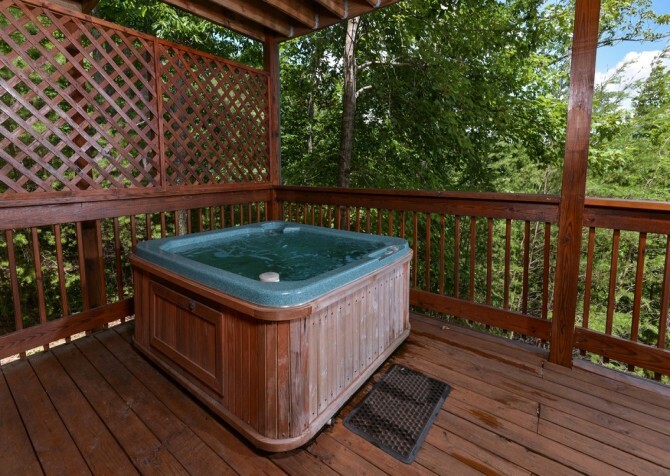 A full bath is located here as well, and outside you will find a jetted hot tub to enjoy as you soak up the fresh mountain air. 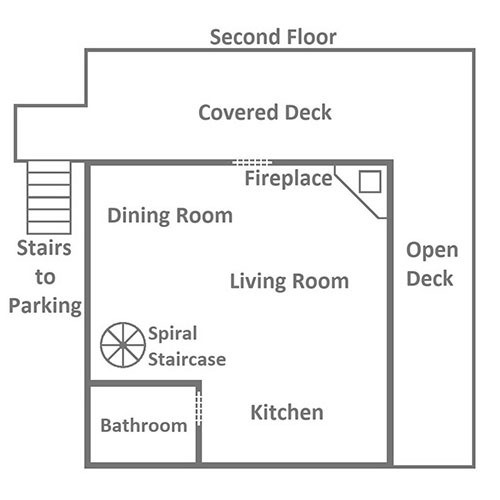 Just off the bedroom is the paved driveway with ample parking for your multiple vehicles. 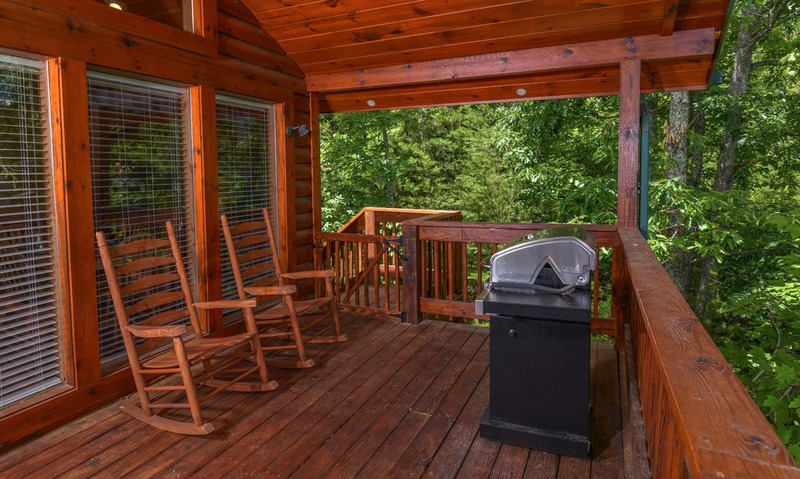 The top floor of American Pride leads out onto a large porch where you can take advantage of the gas grill while looking out over the breathtaking Smoky Mountains. Enjoy a meal on the log-style picnic table in view of the mountains, or take your coffee out in the mornings and rock in the rocking chairs. 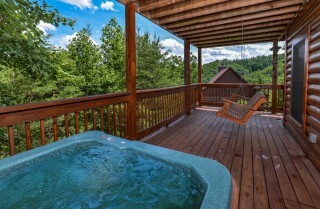 You’ll also find the hot tub and porch swing on the lower porch a relaxing place to enjoy the views. Venture over to the community space and use the covered picnic pavilion for a lunch outdoors, and then head to the catch-and-release pond (open year-round) for some fun fishing practice. 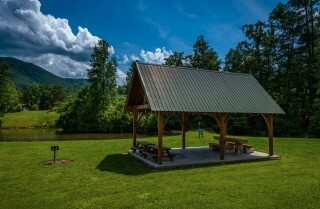 Equipment rentals are even available in summer! 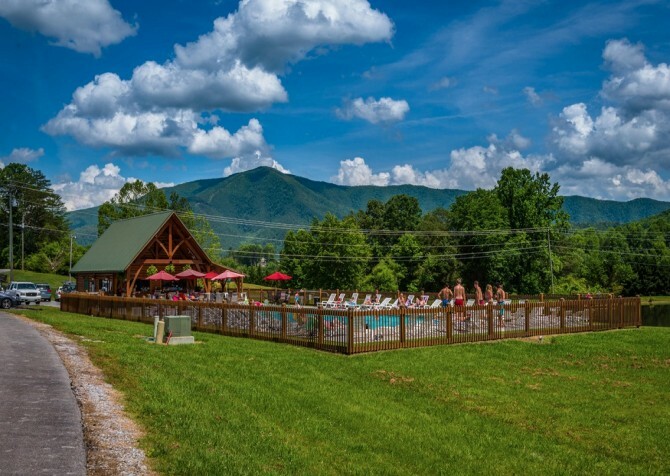 Or the whole family can suit up and take a swim or lay out in the sun with a good book at the awesome swimming pool with plenty of seating. Here you can enjoy the sun and cool water as you look out and remember you are in the Smokies with the vast mountaintops towering around you. It’s truly a view like no other. 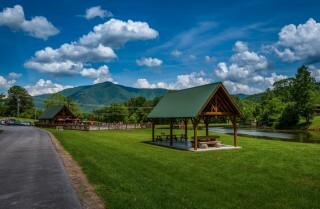 And don’t forget to bring a football or frisbee—there’s plenty of green space here for you and the kids to enjoy. 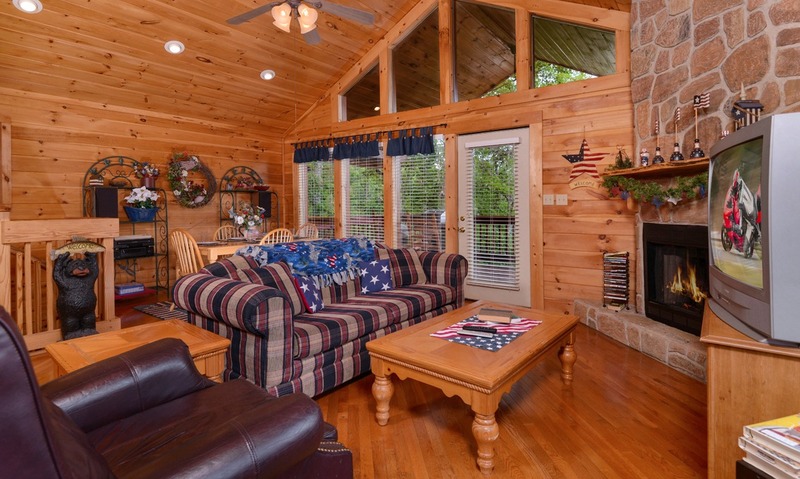 This pet-friendly cabin gives you space for the family and your 4-legged friends. You’ll also have a washer/dryer in the cabin so you can pack light or freshen up clothes after busy days of outdoor fun. And you can stay connected, catch up on emails, or just see what’s happening when you’re here with the high-speed Wi-Fi in the cabin. Just a few miles from downtown Pigeon Forge, Smoky Mountain Ziplines is a fun tree-top tour high above the forest floor. Get harnessed in and get ready for some high-flying fun on their 9-line tour, or book a full package for 3 exciting hours! 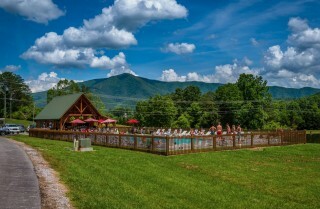 Discover amazing restaurants like The Applewood Farmhouse, or hop over to the Island at Pigeon Forge where the whole family can find something to pique their interests, such as taking a ride on the 200-ft. gondola wheel, catching a fountain show, or shopping in one of the 60+ stores conveniently located here. Head over to the famous Flapjack’s Pancake Cabin or any of the local pancake houses for a memorable Smoky Mountain breakfast. 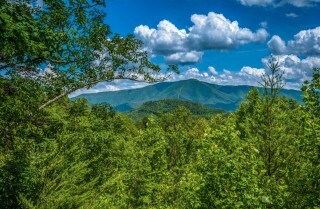 The smell of maple syrup and freshly cooked pancakes plus bacon and sausage will have you happy as can be and ready for a full day of fun in the Smokies. 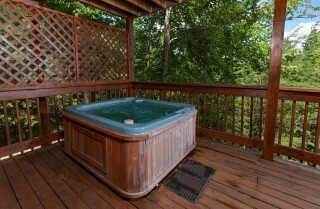 "We thoroughly enjoyed our stay at this cabin. This is our second year visiting Tennessee and we love the cabin experience. The staff was very professional and helpful with our reservation. The check in process was seamless and it was a cozy stay. 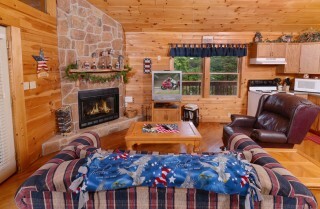 As the…"
"We thoroughly enjoyed our stay at this cabin. 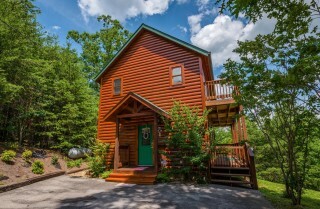 This is our second year visiting Tennessee and we love the cabin experience. The staff was very professional and helpful with our reservation. The check in process was seamless and it was a cozy stay. As the previous guest mentioned, the TVs could be updated and the cleaning service could improve slightly, especially since it’s a pet friendly cabin. 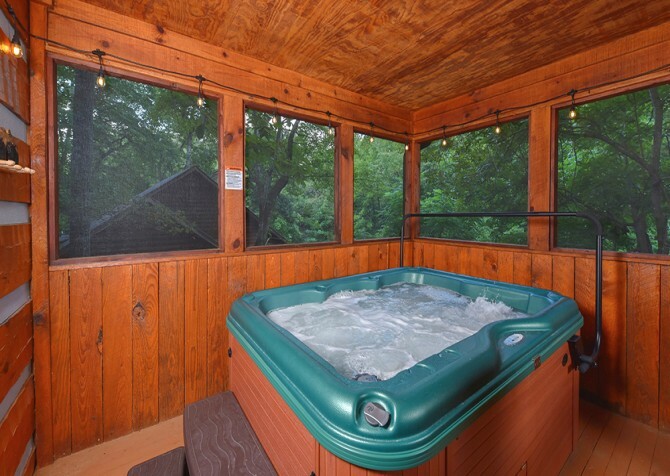 Nevertheless, these are minor improvements and we would definitely stay there again." Thank you for this amazing review and feedback! We are so glad to hear you enjoyed your Smoky Mountain cabin vacation! We will look into the issues you stated, and we look forward to serving you again in the future! "Maybe update TV and radio (booth adaptable or aux input). Just a thought. Other than that everything was great!!! We will be back!" Thank you for taking the time to leave us a review. 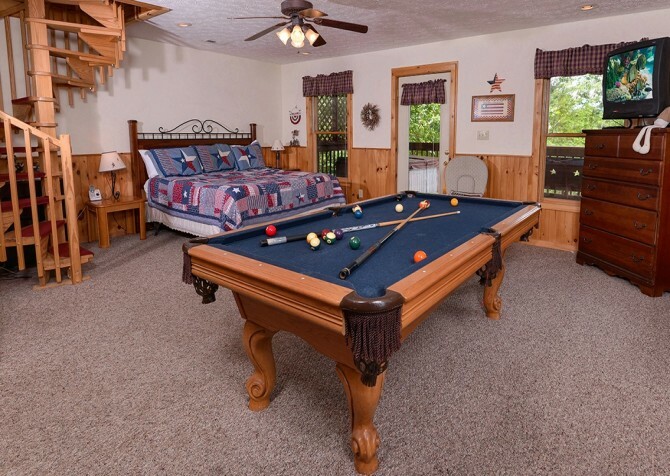 We are thrilled to hear that everything was great during your stay at American Pride. The feedback you left us is great information, and we have passed that along to the proper departments for review. Thank you again for choosing Cabins for YOU, and we hope to see you in the Smokies again! "We just stayed at American Pride we really enjoyed it cabin was very clean and cozy can not wait to go back down there!"